Saving the world, one toddler meltdown and DIY project at a time. I know, yikes. 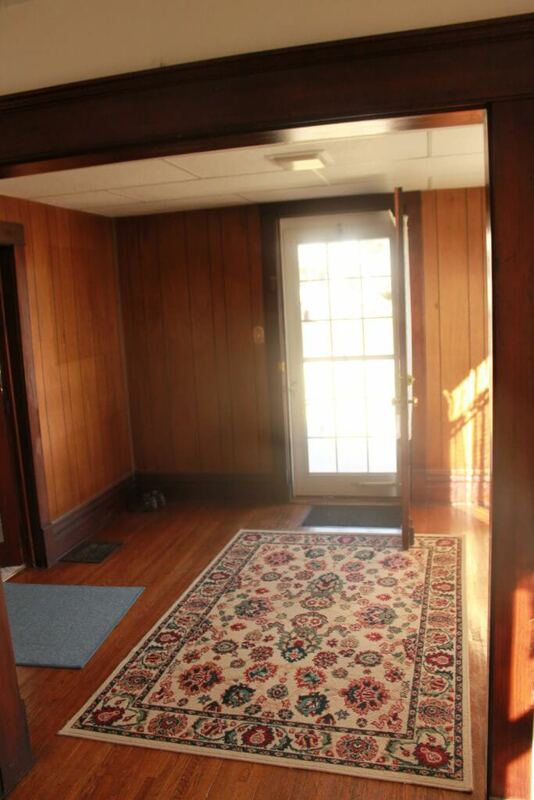 But the great thing about this, is that a little bit of wood paneling never killed anybody. Even though we knew tearing it out and re-drywalling was not an option before moving in (or anytime shortly after, for that matter) I knew I could make it look better, for almost no money. So that’s exactly what I did. See the difference paint can make?! We had had a rough few weeks, for many reasons, and we finally decided one night to start on a project. 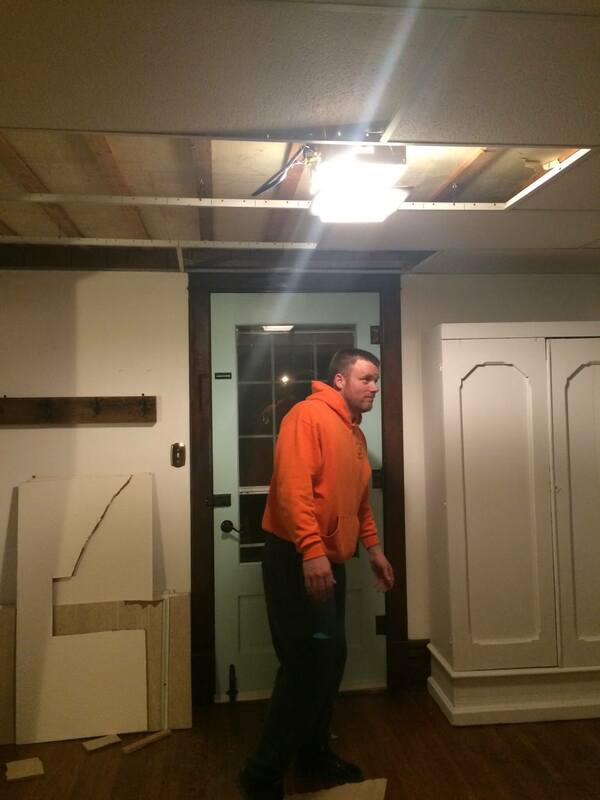 In a matter of an hour, the drop ceiling was completely gone. And, as we anticipated, it was covering a bigger problem. The ceiling underneath was extremely saggy and crumbling with water damage. 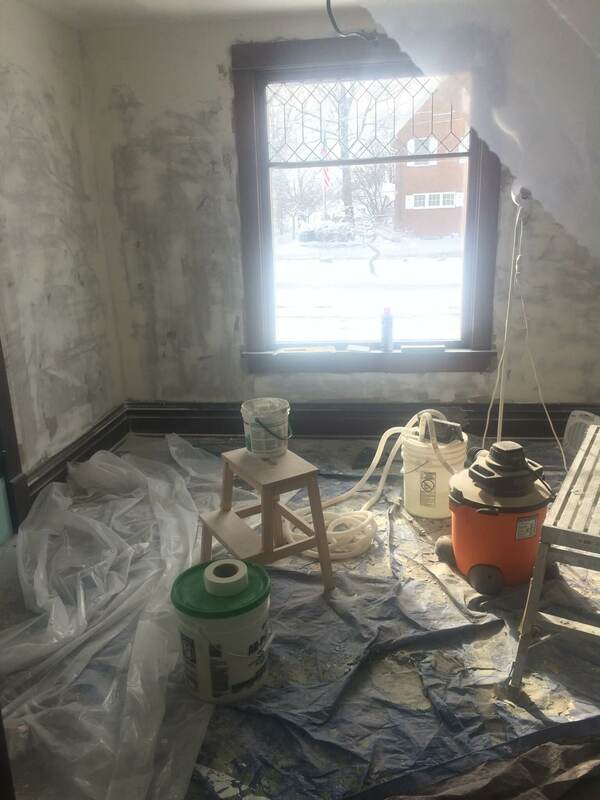 Since the cause of the water damage had long ago been fixed, we decided our best bet was to cover over the damaged ceiling with new drywall, and get it as level as possible. 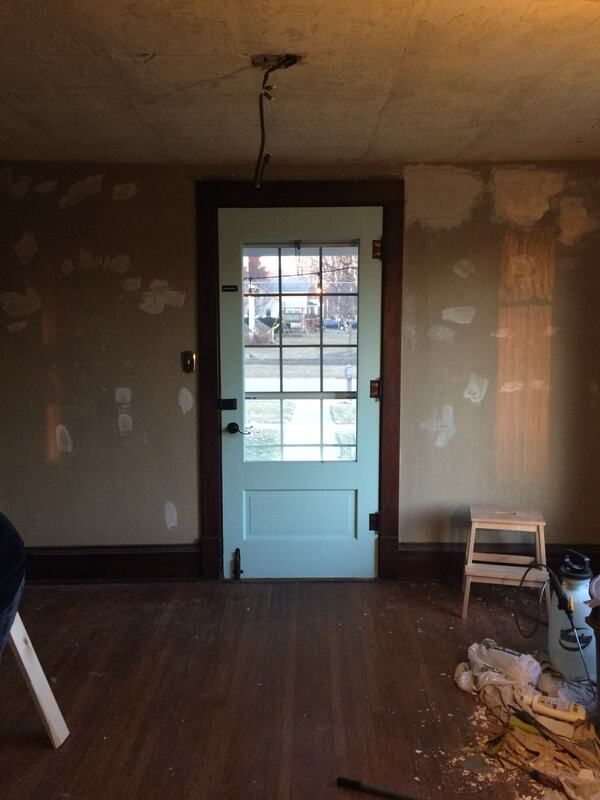 First, we stripped off the wood paneling, and had some–interesting–wallpaper to remove! 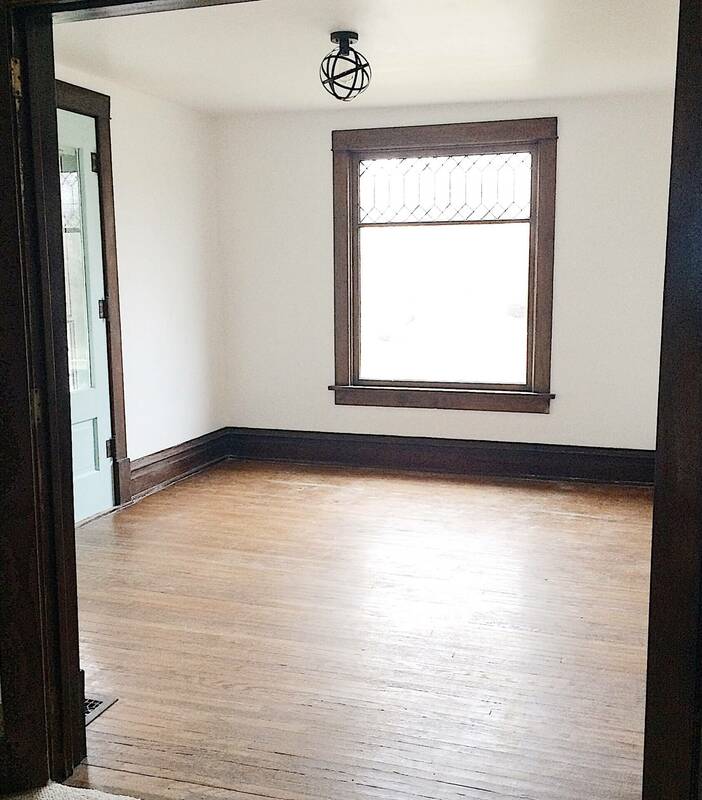 Underneath, however, we found that the original plaster walls were in great shape, and there was no need to redo them! Score! We simply patched and painted over them. The dust flew everywhere and I’m still sweeping it out of corners 2 weeks later! But the end result was sooooooo worth it! Are you ready to see what we came up with?! Isn’t she gorgeous now?! We couldn’t be happier with our decision to redo this room! The difference a nice ceiling makes is just huge!! Another huge bonus is that the ceiling is now 3 inches higher. 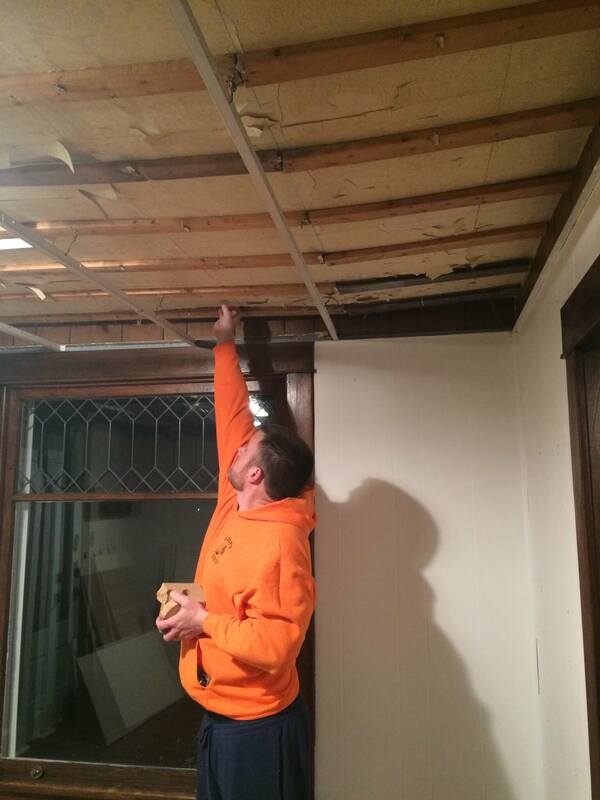 In a house with low ceilings, that can make a huge difference! 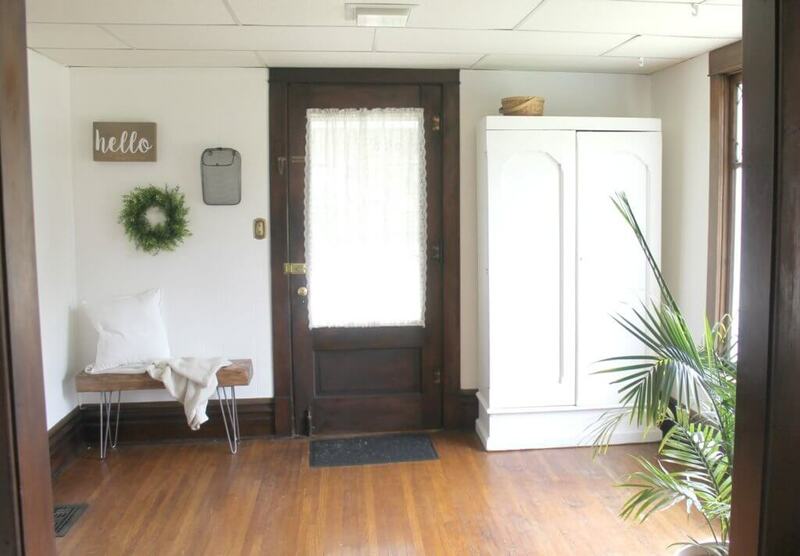 And don’t you just love that light fixture? It was super affordable (available here) and the Eddison bulb inside just really puts it over the top. I think the light fixture really gives a great clue as to the direction we are heading with this space and I can’t WAIT to share our plans with you! That giant picture window is just screaming for a window seat, don’t you think?!! I’m also thinking the door might need painted again as well–you guys voted on my IG stories for a darker, jewel toned blue, and I couldn’t agree with you more!!! Thanks so much for stopping by, and I can’t wait to share the finished product with you guys soon!! Be sure to follow me on Instagram for more behind the scenes details and sneak peaks!! !